Even an area known for its small-town charm can feel a lot less than ideal when you're sick, but the good news is that the kind of urgent care South Pasadena can expect has improved a great deal with the arrival of Dr. Michael Farzam of House Call Doctor Los Angeles. Typically, people in South Pasadena are used to the sort of standard, often very crowded, walk in clinic Los Angeles area communities have by the score. 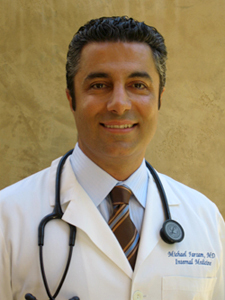 Moreover, many assume that house call doctors are a mid-20th century relic that disappeared sometime before the arrival of color television, the good news is that the finest in health care is now being delivered in homes, hotel rooms, and offices by Dr. Farzam, a widely respected board certified physician. When you need urgent care in South Pasadena, it often simply makes sense to take the House Call Doctor Los Angeles route. After all, when you're sick is a time when, as much as possible, you should be relaxing at home, not stressing yourself out on congested streets or sitting in an office next to other ill people. Also, some of us are just plain too busy to take time off from work to deal with a chronic or ongoing health issue; having Dr. Farzam stop by at your office, work site, or film set might make more a lot more sense than driving to a standard urgent care. South Pasadena residents might also be happy to know that doctors house calls are not necessarily terribly expensive. In fact, they can very often be substantially cheaper with Dr. Farzam than a visit to an emergency room, depending on your type of health coverage. For more information on how Dr. Farzam and House Call Doctor Los Angeles can provide you with the finest available urgent care South Pasadena residents are likely to find. Call 310-849-7991 for further information or visit our contact page.